Camellias produce glorious winter flowers and make excellent container plants for porches or patios in dappled light. They come in a wide variety of forms, sizes, and colors. Bloom time runs from September through March, depending on the variety. Visit local nurseries now to select plants that will bloom in late winter and early spring. A healthy plant will have plenty of leaf and flower buds. Be sure to check the plant carefully for signs of pests or disease. 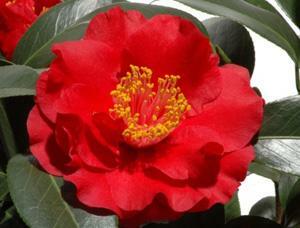 There are more than 250 species of Camellia, and thousands of camellia cultivars. Camellia sinensis is an edible garden plant cultivated for both black and green tea made from young leaves and flower buds. Camellia sinensis and Camellia oleifera produce a fragrant oil. Importantly, camellias provide a source of nectar and food for pollinators such as honey bees and hummingbirds during the cold winter months. How did Camellias get here? Originally cultivated in China and Japan, camellias were brought to England with the expansion of the tea trade in the 18th century, and were first planted in America in 1797. Pioneering settlers brought camellias west to California in the mid-19th century. In the early 20th century, camellias began to be appreciated as woodland shrubs, and this new interest led to the introduction of many new cultivars and hybrids. Camellias are shallow-rooted and require well-drained, acid soil. Mature plants are water wise and drought tolerant. Often deep watering is needed only once a week in the summer, while long-established shrubs may survive with little to no summer water at all. If it is a dry winter, water is needed when the soil feels dry. Prune for shape and health when blossoms end. Camellias are winter-hardy plants that thrive in our Mediterranean climate. They bloom best when sheltered from full sun and drying winds. They benefit from an acid, phosphate-rich fertilizer applied in March, April, and May. No summer feeding is needed. A final feeding can be given in mid-fall before bloom. Avoid over-watering and over-feeding. When watering, be sure to give them a deep soaking to leach accumulated salts out of the root zone. In addition, chelated iron may be used if chlorosis is a problem. Read the package label and follow the recommended rates. Pruning should be done after flowering, in the summer or fall. Remove any dead wood or weakened branches. Thin out center of plant to allow for better air circulation. When planting a camellia, cultivate the soil to eight or ten inches deep and mix in plenty of organic matter to encourage root growth and development. Place the plant so that the root ball is level with the soil surface. Never allow soil to cover the base of the plant. Keep the root zone evenly moist, cool, and weed free by mulching with two to three inches of organic mulch. 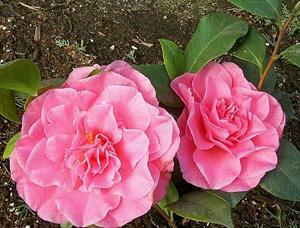 Camellias are slow to establish because they are slow growing and have shallow roots. Older plants will grow in full sun when their roots are shaded by leaves. Camellia japonica and Camellia sasanqua: what’s the difference? 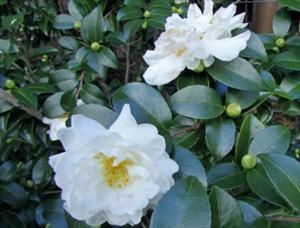 The two types of camellias you will encounter at nurseries are Camellia japonica and Camellia sasanqua. Camellia japonica is the “standard bearer” for camellias, bearing large, rounded leaves, a tight growth habit, and large flowers in shades of white, red or pink. These blossoms are three to five inches wide. The flowers may be single, semi-double, or double. 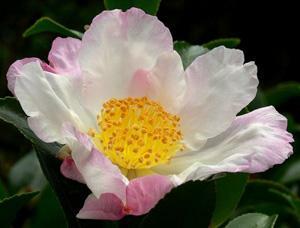 Camellia Japonica grows to a height of 25 feet, but is usually kept at six to twelve feet. Different varieties have bloom times ranging from September to April. Camilla sasanqua has an open growth habit and can be upright and bushy or low and spreading. It has small, narrow, pointed leaves, and small, fragrant, single, white, red, or pink blossoms two to three inches across. It blooms in December. Camellia Sasanqua's height ranges broadly, from just one foot to over twelve feet high. Although its flowers are smaller than and not as long lasting as those of Camellia japonica, it blooms profusely and can take more sun. A common fungus disease of camellias is Camellia petal blight, or Ciborinia camelliae, which affects all cultivars of Camellia japonica. 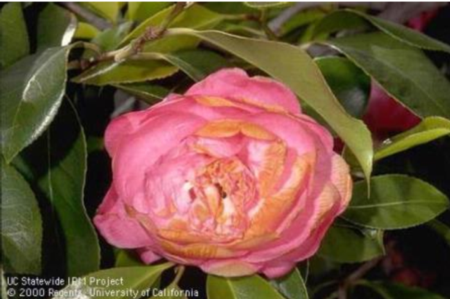 Camellia sasanqua is infected less often in California. Disease development requires cool, moist conditions in early spring just before or during early bloom. The disease first appears as small, water-soaked spots or as large, single, and brown to tan areas in the flower center. During proper weather conditions the smaller spots rapidly expand to encompass most of the bloom. Petals are quite slimy to the touch. The fungus carries over to the next season on fallen, diseased blooms. Prevention of the disease through proper sanitation is preferable to use of fungicides. Remove all infected flowers and discard. Rake up and dispose of old mulch, as disease spores can survive here as well. Here’s where you can learn more about camellia petal blight. Prevention is the best control. Remove the top layer of potting soil when new plants are purchased and replace it with pathogen-free soil. Plant camellias in a well-ventilated location and avoid overhead irrigation. Pull off infected flowers as they appear and collect fallen blossoms and dispose of them in a covered location away from camellias. Do not add camellia petals or leaves to mulch that will be used around camellia, even if it has been composted. It is difficult to expose camellia debris to the 140°F required to kill all of the Ciborinia propagules by composting. Each year, when blossoms are no longer present, apply a fresh layer of pathogen-free organic mulch and maintain a 4-inch layer of organic mulch beneath and somewhat beyond plants to suppress pathogen spore production. Remove fallen petals and other camellia debris before applying fresh mulch, but otherwise avoid moving or disturbing existing mulch where fungi may be present. Keep mulch thin near the trunk or several inches away from the trunk. Spraying an appropriate fungicide during bloom can help to reduce infections. Depending on the fungicide, reapplication may be needed every 10 to 14 days while conditions remain suitable for the pathogen. Use fungicides only in conjunction with recommended sanitation and cultural practices.